3 The Difference Between Kinesio Tape To Other Athletic Tapes? 4 Do The Different Tape Colours Mean Anything? The word Kinesio comes from the word kinesiology. Kinesiology is defined as the study of body movements. The history of kinesiology tape comes from Japan. The original Kinesio® Tex tape was invented in the 1970’s by chiropractor, Kenzo Kase. Kase created a protocol and Kinesio Taping® technique on how to apply the tape properly. He also founded the Kinesio Taping Association back in 1984. You can see Dr. Kenzo Kase applying the therapeutic tape with his expert skills in this photo slide show. Using kinesio tape on athletes has been around for a long time, but, it was probably only since the 2008 Beijing Olympics that the widespread use of the tape became a lot more popular. I remember seeing all these Olympic athletes with this funny coloured tape in strange shapes and in different directions all over their bodies. Even at the London 2012 Olympic games athletes are still getting treated taped by their coaches, physiotherapists, chiropractors or sport physcians. This athletic tape is not the typical rigid, supportive, athletic tape we have all seen in the past. All the different colours really make Kinesio tape stick out on TV or watching live in the stadium. UK footballer David Beckham has photographed with the pink version of coloured elastic tape on him. Lance Armstrongs chiropractor, Jefferey Spencer, used Kinesio tape on Lance on the Tour de France cycle race. Swimming, beach volleyball, wrestling, rugby, soccer, golf, tennis, gymnastics. You could name about any sport on TV and you might have seen an athlete wearing some. You even get equine kinesio tape now for horse racing and show jumping. The Difference Between Kinesio Tape To Other Athletic Tapes? The company that manufactures Kinesio® Tex tape has said it can help a range of issues: from pain relief to lymphatic drainage for enhanced healing. 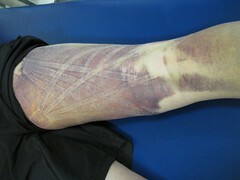 When Kinesio tape is applied to a bruise muscle it creates a wave-like effect on the skin. This wave-like effect is thought to help with lymphatic drainage of odema (swelling) in the damaged area. Like the hamstring injury picture slide show example above, you can see where the tape was on the skin . Lifting the skin up increases the surface area between the epidermis and dermis skin, which allows improved drainage of the inflammatory fluids and helps to change the sensation in the nerve endings in the area. This is not the aim of traditional athletic tape. Those kinds of tapes are designed to restrictive and are meant to inhibit movement at a joint. On the other hand kinesiology tape wants to promote movement and proprioception. Do The Different Tape Colours Mean Anything? I asked a physiotherapist who uses kinesio tape this question and she told me that the different colours are based on colour therapy. There is no resistance/support difference between the different tape colours. So the colour of the Kinesio tape used doesn’t mean you are getting a softer or harder tape. Maybe an athlete has a specific colour preference for their clothing outfit or they just like a specific colour. You can get all kinds of different sizes from a small box to clinical size length of rolls of Kinesio® Tex tape. Below is an example of a box of the original tape roll. Since the original kinesio tape has surged in demand around the world since 2008, I have seen other companies produce their own version of the elastic therapeautic tape. One of the easiest to apply by yourself tapes that I have seen is the pre-cut for you deisgns from Spidertech. CrossFit athletes at the CrossFit games and in training boxes all seem to be wearing RockTape, another competitor in this medical taping world. 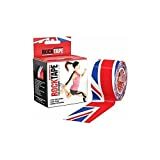 I must say RockTape do have the best designs on their tape like countries flags. Want to learn how to tape properly without needing to go on a seminar or training? Click here to buy a kinesiology taping book with a 90 minute DVD on how to tape. I found some videos showing you examples on how to use both the Spidertech pre-cut kinesiology tape and the Kinesio® Tex taping method on a lower back, hamstring muscle and knee area. The videos show you how to apply the tape correctly. This is the SpiderTech lower back taping technique. Buy some here. This is the SpiderTech hamstring muscle taping technique. Buy some here. This is the SpiderTech knee taping technique. Buy some here. So as you can see Kinesio tape is very elastic and can be used in so many ways. If you have been to a healthcare professional recently who applied some of this “magic” tape on an injured area I hope this helps you understand a bit more about why the tape was used on you. Have you had Kinesio tape put on you before and found a big difference? I would love to hear your comment below.